Figure 1: Tear of the dorsal membrane of the trachea, resulting in subcutaneous emphysema, pneumomediastinum, and dyspnea in a cat. This cat’s tracheal tear was treated surgically. I recently received a call from a good friend who also is a referring veterinarian. Our conversation reminded me of an important topic I’ve been meaning to write about: identifying and containing life-threatening risks associated with dental procedures. In addition to the typical risks associated with anesthesia, there are some life-threatening risks specifically associated with dental procedures that can be prevented once practitioners are aware of them. Unfortunately, there are very few practitioners who have been made aware of the risks during their training in veterinary school. The first risk that must be brought to the forefront is that of tracheal rupture. Tracheal ruptures are more frequent during dental procedures than any other procedure.1,2 In one retrospective study, 75 percent of tracheal ruptures were associated with dental/oral surgical procedures.2 The increase in tracheal rupture prevalence during dental procedures is probably due to an overzealous concern for aspiration while using liquids in the oral cavity during the dental procedure. 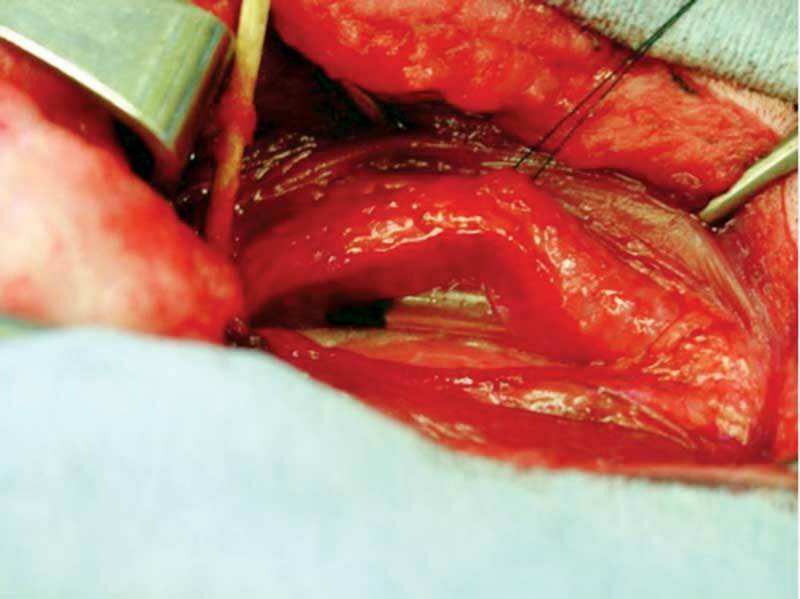 The concern is having a watertight seal of the cuff that might cause inadvertent excessive inflation of the cuff, resulting in rupture of the dorsal membrane of the trachea (Figure 1). Another possible explanation of increased prevalence of tracheal rupture during dental procedures is that patients in lateral recumbency require at least one episode of repositioning, and if the patient is not detached from the anesthesia hoses during repositioning, torque on the inflated cuff may result in a tear of the dorsal membrane of the trachea. Though tracheal ruptures can occur in either dogs or cats, they are more common in cats. Tracheal ruptures may result in immediate signs, including subcutaneous emphysema, pneumomediastinum, pneumothorax, pneumopericardium, and decompensation during anesthesia. Other immediate signs seen after the procedure may include dyspnea, coughing, gagging, anorexia, lethargy, and respiratory stridor. However, signs of tracheal rupture may not be apparent until days after the procedure. In addition to outright rupture of the trachea, pressure from the cuff can cause a delayed effect of necrosis of the trachea that may cause similar signs listed above or stenosis of the trachea secondary to inflammation and scarring. Figure 2: Eccentric inflation of this cuff may not only provide a poor seal, but also may place more pressure on the lining of one side of the trachea. One retrospective study of 20 cases showed that 15 cats with moderate dyspnea were treated conservatively, whereas four cats with severe dyspnea were treated surgically. One cat died suddenly without the benefit of medical or surgical intervention. Of the 19 cats treated, 18 had improvement of clinical signs, and one cat died after surgery.2 In another retrospective study of 16 cases, nine cats were treated surgically, and seven were treated conservatively. How do we prevent tracheal rupture in cats? First and foremost, avoid excessive inflation of the cuff. How many milliliters of air are required to inflate the cuff of an appropriately sized endotracheal tube in a cat? One study found that number to be 1.6 +/- 0.7 ml, or on average anywhere from 0.9 to 2.3 ml.1 The same study found that inflating the cuff with 6 cc of air in cadaver cats resulted in tracheal rupture in seven out of 10 cats, meaning we should dispose of our 10 cc syringes to fill cuffs. Special syringes exist that allow you to more easily record number of milliliters used and the amount of pressure in the inflated cuff. Use the least amount of air necessary to prevent an audible leak when placing your ear next to the patient’s mouth to listen for a leak. Once the leak is no longer heard, no further inflation is necessary. The type of tube used may play a role in tracheal ruptures, although any tube can cause tracheal rupture.1 Low-pressure, high-volume cuffs may help avoid rupture by requiring a higher volume of air to cause a similar change in cuff size, and the cylindrical shape of the inflated cuff may distribute forces over a larger surface area. Cuffs should be inflated prior to use not only to ensure they hold air, but also to ensure the cuff does not inflate eccentrically (Figure 2). Always detach the anesthesia hoses when moving the patient from one position to another. 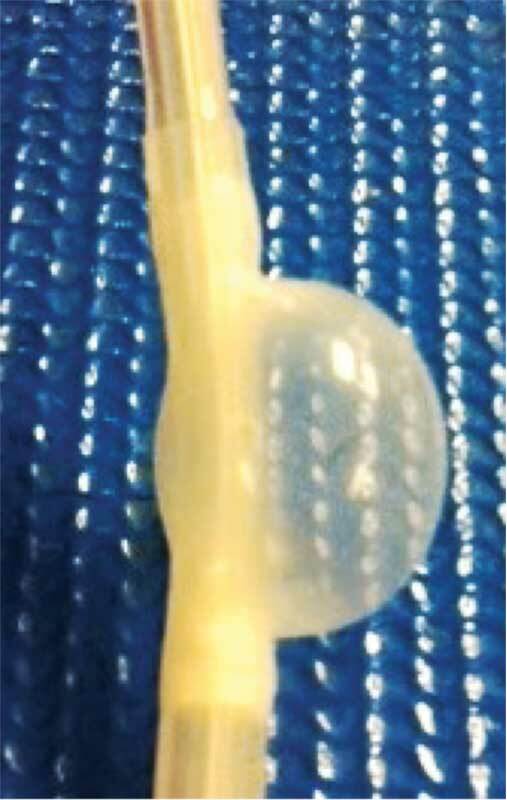 Use lube to avoid excessive torque on the dorsal membrane of the trachea and to improve a watertight seal. Make sure the lube used contains no chlorhexidine, as it can irritate the tracheal lining. If a stylet is used for intubation, prevent it from extending beyond the pointed tip of the endotracheal tube to avoid excessive trauma upon intubation. 1 Hardie EM, Spodnick GJ, Gilson SD, Benson JA, Hawkins EC. “Tracheal rupture in cats: 16 cases.” (1983-1998). J Am Vet Med Assoc. 1999; 214(4):508-512. 2 Mitchell SL, McCarthy R, Rudloff E, Pernell RT. “Tracheal rupture associated with intubation in cats: 20 cases (1996-1998).” J Am Vet Med Assoc. 2000; 216(10):1592-1595.